We’re basically walking around in the Arctic here in NYC. I think my eardrum froze yesterday. It’s bad. I’ve been loading up on these moisturizers though, so although I’m partially deaf and afraid that even my soul is frozen, at least you can’t tell on my skin. 1) Neutrogena Hydro Boost Gel-Cream, $15 – This is like a tall glass of water for your skin. Almost literally, though: this is a water-based gel that’s super lightweight and not sticky. Plus it has skin-plumping hyaluronic acid that gives moisture back to the skin. The olive extract helps protect the skin from moisture loss. It basically locks moisture in your skin. It’s a great first-thing-in-the-morning moisturizer. 2) Elizabeth Arden Eight Hour Cream, $17 – I think I’ve sang my praises for this to all my friends by now. And I always say the same thing: the medicinal scent is not for everyone (I personally hate it) BUT. BUT. This is the best moisturizer I’ve found for my skin, hands-down. That’s why it’s always in my bag. Before flights, before bed, under my eyes, on my lips, elbows, everywhere. If my skin is ever acting up, I apply this before bed, and my skin is so much softer in the morning. It’s a thicker, gel-based cream that is a tad greasy, and glycerin-ey, but it hydrates my skin like no other. 3) Dove Quench Absolute Shampoo and Conditioner, $7 each – Sooo this is specially formulated for the curly haired — therefore not me, my hair is wavy — but that didn’t stop me from stealing a page from their book. The line is so nourishing for dried out locks, and it smells beautiful — like coconut and happiness. 4) BareMinerals Complexion Rescue Gel Cream, $29 – I already wrote how much I love this tinted BB/CC cream just the other day here, but this is seriously the only thing I’ll wear in the winter and it lets my skin show but also hydrates it so it looks like I’m wearing nothing. 5) Estée Lauder Advanced Night Repair, $92 – This is a repair serum that helps fight signs of aging and just a little goes a long way. I recently re-discovered this, and apply a little under my cream at night. It also has skin plumping hyaluronic acid, and algae extracts which helps repairs cells. In their studies, 83 percent of women felt their skin looked healthier and more rested in just 4 weeks (*raises hand). 6) Aquaphor, $5 – If you want just one, affordable, heavy duty cream to ease your winter woes, then Aquaphor. This is another little tube I keep with me to use on my lips or under my eyes to protect against the blistery cold. Also great to apply to chapped heels or even as a hand balm/cuticle saver. 7) Elizabeth Arden Eight Hour Nighttime Miracle Moisturizer, $39 – Seeing how much I love the original Eight Hour Cream, I had to try Elizabeth Arden’s Nighttime Miracle Moisturizer. The good news is they added a little lavender to this so it smells better than the original. It’s a thicker situation than the original as well so I only use it sparingly since it can be overpowering. I’ve been using a little under my eyes and on ares prone to turn patchy with the colder weather. 8 ) 100% Pure Organic Coffee Bean Eye Cream, $21 – I’ve loved this small brand ever since I tried their brightening pineapple enzyme peel mask. This eye cream has anti-inflammatory green tea, and the coffee helps reduce puffy under eyes and dark circles. And true to the brand’s ethos, it’s made only with 100% pure ingredients (also every single person who tested it said it improved skin hydration and moisturization). 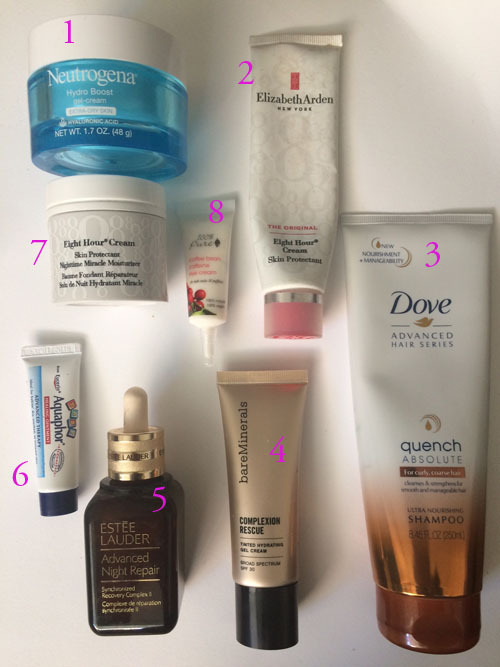 What moisturizers are you relying on for the winter? Hi, what shade do you wear for BareMinerals Complexion Rescue Gel Cream? Thanks!